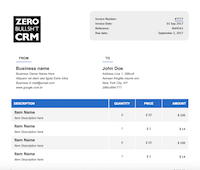 Get Paid Quicker & Easier with ZBSCRM Easy Invoicing. Don't waste time creating invoices in 3rd party apps or in Word. 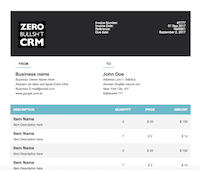 Zero BS CRM lets you quickly create invoices for your contacts, send them, and get paid. All from your WordPress website. 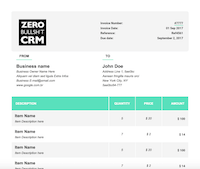 Create an invoice for your contact with our easy invoice builder. 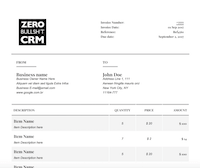 See how the invoice will look as a PDF. Easily send to your client with one click. Sit back and relax while your contact pays your invoice. All your paperwork is done! Keep track of all your invoices in one place. Follow up with any overdue or unpaid invoices, and add new invoices easily. ZBS Invoices couldn't be easier to use. From business setup, to issuing the invoice to your contact, we have kept our invoices super simple to use. Saving you time and getting you paid quicker - because profit is more important to your business than useless features. 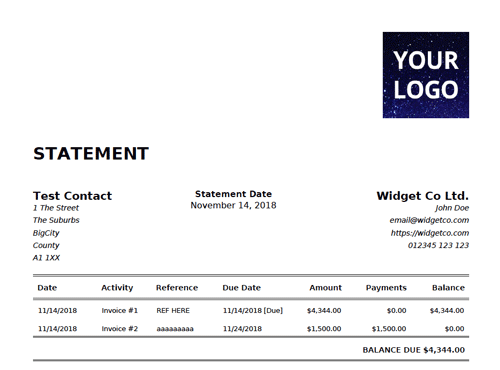 The header of your invoice shows the status, the due date, and other useful information about your business. Easily itemise your invoice for your contact. Show a detailed breakdown of the work completed and reduce any questions about the invoice total value. Using Invoicing Pro you can maintain a 'product index' and quickly add these to your invoices (saving even more time). Need to charge tax or postage on your invoices? We've got you covered. 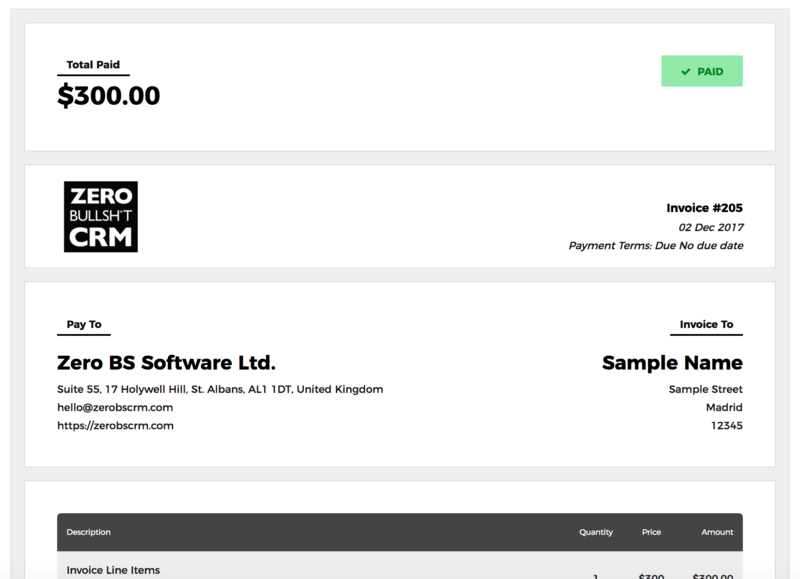 You can even choose to apply (and display) discounts to the invoices. This is a great way of giving back to your loyal customers. New Feature As of v2.96.6 you can now send PDF statements of invoices & due amounts to your contacts with 1 click from the contact record! Get Paid Online. Choose extra PDF templates. Have Recurring Invoices and save time by using our Invoice Itemiser. Get paid instantly with PayPal or Stripe. No more waiting for bank transfers or chasing manual payments. 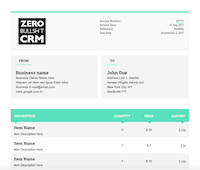 Choose from extra invoice templates to wow your clients. 6 additional templates available. Using Stripe or PayPal's subscription features you can create recurring invoices. Perfect for monthly billing. Create a list of invoice line items and then quickly add them to any new invoice you create. 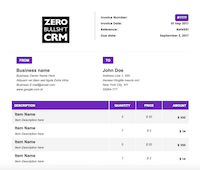 Watch how easy it is to create an invoice with Zero BS CRM.